Step Beyond the Ordinary into the Extraordinary. 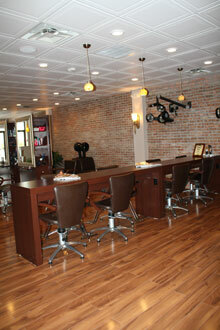 From the minute you walk in you will be greeted by our friendly and highly skilled staff. You will immediately become aware of our "relaxed, not rushed" atmosphere and realize Salon Beyond is the perfect place to come to unwind. Our salon offers a variety of hair care services, including precision cuts, creative hair color, and texturizing perms and relaxers. We also provide air brush makeup applications, facials, waxing, nail care, hair extensions, and airbrush tanning. We also offer comprehensive bridal package, including hair styling and airbrush makeup. We can provide these services at our salon, or we can come to you on your wedding day. Inquire about our bridal party "day at the spa" package which includes a one hour facial, a one hour complete body massage, and a manicure with pedicure.